Flowers come in many different shapes and sizes, but their symmetry is usually described in a binary fashion. Some flowers are bilaterally symmetrical, also known as zygomorphic or monosymmetric (for example, sweet peas). 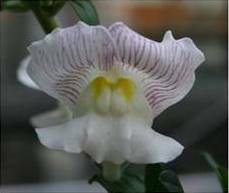 These flowers have a clear top (dorsal side) and bottom (ventral side), and it is only possible to draw a single line of symmetry through them. The alternative state is to be radially symmetrical, also known as actinomorphic or polysymmetric (for example, poppies). 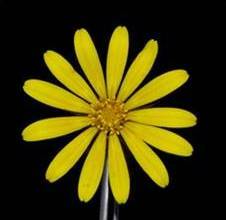 It is possible to draw many different lines of symmetry through an actinomorphic flower. Although we generally think of flowers as having only one of two options when it comes to their symmetry, in fact the overall form of a flower can arise from differential development of organs in one or more whorls of the floral meristem. 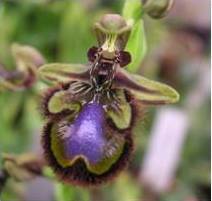 Many orchids, for example, show extreme bilateral symmetry, with the inner tepals clearly zygomorphic, and the stamens and carpels fused into a single gynostemium, itself often dorsally positioned (Fig 1). The flower of snapdragon (Antirrhinum majus) is the classic genetic model in which zygomorphy has been studied, and its symmetry is based on expansion of the dorsal petals relative to the lateral and ventral ones but abortion of the dorsal stamen (Fig 2). In contrast the flowers of a number of species of Solanum show zygomorphy only in the stamen whorl, with differential development of anthers to fill feeding or pollinating roles in their interaction with pollen-collecting bees (De Luca and Vallejo-Marin, 2013). These variations in symmetry can be most dramatic in the Asteraceae (the daisy family), where in different species or varieties different combinations of actinomorphic, slightly zygomorphic and strongly zygomorphic florets combine in a condensed inflorescence to produce a flower head (capitulum) that appears fully radially symmetrical (Fig 3; Chapman et al. 2012). flower is dependent on the actions of both dorsalising factors (the partially redundant TCP transcription factors CYCLOIDEA (CYC) and DICHOTOMA (DICH)) and ventralising factors (the MYB transcription factor DIVARICATA (DIV)) (Luo et al. 1996; Almeida et al. 1997). In 2005 Corley et al. used a combination of genetic and molecular approaches to define a further MYB protein, RADIALIS (RAD), as a target of CYC/DICH and the antagonist to the ventralising signals provided by DIV, which is transcribed in all regions of the floral meristem. A model in which RAD and DIV competed to bind promoter regions of downstream ventral-specific genes was the simplest explanation, with DIV outcompeted by RAD in the dorsal parts of the flower as RAD is activated by CYC/DICH in this region. Recent work by Raimundo et al. (2013) has dissected the molecular interaction between DIV and RAD in more detail, and has shown that the mechanism of symmetry determination is a little more complicated than initially supposed. The authors determined the optimal DNA binding site of the DIV protein, and found that RAD did not bind the same motif. Moreover, RAD did not displace DIV from a DIV-DNA complex, and RAD and DIV proteins did not interact in a yeast 2 hybrid assay. Having effectively disproven the earlier model, the authors then reasoned that RAD and DIV might interact through a third protein. Using RAD as bait in a yeast 2 hybrid screen they identified a pair of novel MYB proteins, which they termed DRIF1 and DRIF2. Tests with DRIF1 showed that it also bound to DIV, and that the DIV-DRIF1-DNA complex was disrupted by the addition of RAD, which competed with DIV not for the DNA but for the DRIF1 protein. Analysis of the subcellular localisation of these proteins revealed that RAD is present in both cytoplasm and nucleus, while DIV is found in the nucleus only. DRIF1 was found to be nuclear localised in the presence of DIV, but cytoplasmically localised in the presence of RAD. In combination these data show that the antagonism between dorsal and ventral activities that occurs when RAD and DIV are both present in the dorsal part of the floral meristem is due to the ability of RAD to sequester the DRIF proteins in the cytoplasm, preventing their interaction with DIV and consequently preventing the DIV protein from activating transcription when bound to DNA. This mechanism is not unique to floral symmetry. The sequestration of key components of transcriptional complexes in the cytoplasm is a common theme in many aspects of both plant and animal development, including in the processes (such as the floral transition) that occur in response to light signals. It is a system that is both robust and flexible, and has the potential to be adapted to suit a variety of specific requirements. It is perhaps fitting, given that complexity of zygomorphic flowers in their many forms, that the control of floral symmetry operates through a similarly complex molecular interaction. Almeida J, Rocheta M & Galego L 1997. Genetic control of flower shape in Antirrhinum majus. Development 1244, 1387-1392. Chapman MA, Tang S, Draeger D, Nambeesan S, Shaffer H, Barb J, Knapp S & Burke J. 2012. Genetic analysis of floral symmetry in Van Gogh’s sunflowers reveals independent recruitment of CYCLOIDEA genes in the Asteraceae. PLoS Genetics 8, (3), e1002628. Corley S, Carpenter R, Copsey L & Coen E. 2005. Floral asymmetry involves an interplay between TCP and MYB transcription factors in Antirrhinum. PNAS 102, 5068-5073. De Luca PA & Vallejo-Marín M. 2013. What’s the “buzz” about? The ecology and evolutionary significance of buzz-pollination. Current Opinion in Plant Biology 16, 429-435. Luo D, Carpenter R, Vincent C, Copsey L & Coen E. 1996. Origin of floral asymmetry in Antirrhinum. Nature 383, 794-799. Raimundo J, Sobral R, Bailey P, Azevedo H, Galego L, Almeida J, Coen E & Costa M. 2013. A subcellular tug of war involving three MYB-like proteins underlies a molecular antagonism in Antirrhinum flower asymmetry. The Plant Journal 75, 527-538. This entry was posted in flowering, Uncategorized and tagged Beverley Glover. Bookmark the permalink.